Q: Tell us about some of the important historic Christian sites in Macedonia. A: There are many important historic Christian sites in the Republic of Macedonia because, as you know, Christianity appeared in Macedonia during the first century. Within the borders of today’s Republic of Macedonia we have famous ancient cities which used to be bishop’s cathedrae from the first centuries of Christianity, such as Stobi, Skopje (Scupi), Bitola (Heraclea), Strumitza (Tiberiopolis), and others. However, the best preserved are the churches from the golden age of the Byzantine Empire. For example, in Ohrid we have the St. Sophia Cathedral from the eleventh century; in Kurbinovo is the St. George Church from the twelfth century; also in Ohrid is the Most Holy Theotokos Peribleptos Church from the thirteenth century; in Banyani is the St. Nikitas Church from the fourteenth century; and in Staro Nagorichane is the St. George Church, also dating from the fourteenth century. There are also frescos painted by the famous iconographers Michael and Eutychius. These are only a few of the more famous sites. Q: How did you come to Christianity? What influenced you to become a monastic? A: In our fatherland, the abundant Holy Tradition of the Orthodox Church has been well preserved. Actually the greatest part of our history overlaps with the history of the Church. Nearly all of our most renowned enlighteners and writers were monastics. The logical result of this Tradition is that the youth are drawn to the Church. Having all this in mind, the reason for my becoming a monastic was, certainly, not so much my love of God, as it was His love for me. The only way to answer freely to this love is to say Amen. Q: How did you realize the need to unite with the canonical Church? A: The unity of the Orthodox Church is achieved through the Bishops. Because of the proximity of Holy Mount Athos and our close communications with the monastics there, we became aware of the schism. 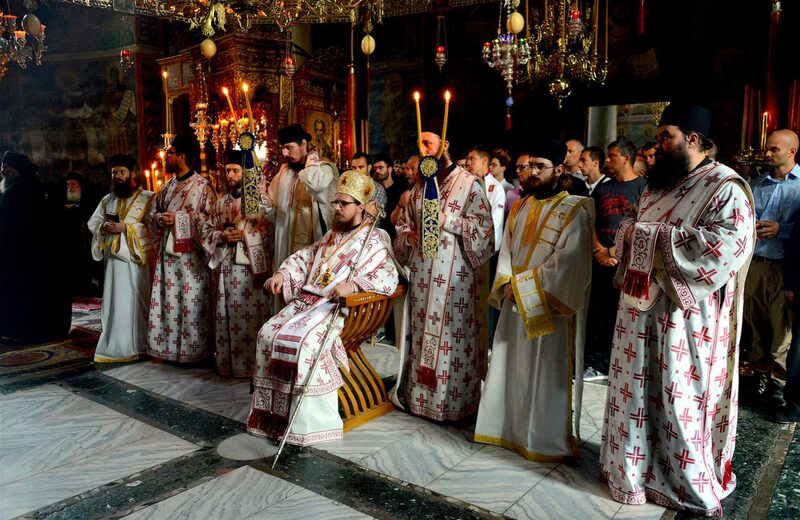 But the fullness of liturgical and canonical unity could be achieved only after His Beatitude Archbishop of Ohrid and Metropolitan of Skopje kyr kyr Jovan put an end to the problem of the schism by establishing a canonical jurisdiction. Q: How many monastics are there in the Ohrid Archdiocese? A: Four monasteries acceded to the canonical autonomous Ohrid Archbishopric. With a few more recent tonsures, the estimate would be about forty monastics. Q: Describe how the monastics are now living. Are they living together? In apartments? Are they able to keep the monastic cycle of services? A: After the police brutally expelled them from their monasteries (without a court order or a period of time to move), the monastics, even in appallingly bad conditions, resumed living according to their established typicon without divergence. Now they continue to live on private properties, in houses or apartments. Q: How do you and the rest of the clergy serve the lay people of the Ohrid Archdiocese? A: Besides monasteries, there are parishes in which parish priests serve the lay people. Here I would like to emphasize that this year’s annual report of the State Department concludes that the Macedonian Government, together with the schismatic MOC, placed fierce restrictions on the parish priests and lay people. But, in spite of this, the parish priests and the lay people have not given up celebrating the entire annual cycle of services. Q: Are many believers now with the canonical Church? A: In our country the Christian Tradition is dangerous to follow. Many people, because of the schism, go to the MOC for folklore and national customs. But there are many who know what the Church is, who come to Liturgy in the autonomous Ohrid Archbishopric. Q: What do most Macedonians think about the state persecution of the Church? A: Those who do not know what the Church is see the MOC exclusively through the prism of ethnophyletism. The government hides the persecution behind false patriotism. Let us remember that power in Macedonia lies in the hands of former Communists, who changed the name of their party, but not their character. In this case the words of the Gospel are being fulfilled: The time cometh that whosoever killeth you will think that he doeth God service (John 16:2). Q: Do you have any contact with the MOC? A: We have no communication. The Assembly of Bishops and our Synod, like a worried mother, have called them on several occasions. But schisms include separation, isolation. Unfortunately, the schismatics of the MOC are closing themselves off more and more, even to basic communications with the Church. Q: Who has been taking charge of the Archdiocese since the imprisonment of His Eminence Jovan? A: The Orthodox Archdiocese of Ohrid has its Holy Synod. Besides the Chairman of the Synod, His Beatitude Archbishop of Ohrid and Metropolitan of Skopje kyr kyr Jovan, the Synod consists of His Eminence kyr Joachim, Bishop of Polog and Kumanovo, who is Vice Chairman of the Synod, and His Eminence kyr Marko, Bishop of Dremvitza and Administrator of Bitola, who is assistant Bishop to Archbishop kyr kyr Jovan. Q: How do you strengthen yourselves in the midst of these persecutions? A: When our local Church suffers we know that the entire Church suffers. Let us remember that according to the words of the Holy Apostle Paul, God’s strength is made perfect in weakness (II Cor. 12:9). We know that our joy is savored by the entire Church. The mystery of the Church is really great. Q: What has being persecuted for the sake of Christ’s Church taught you? What has been your message to the faithful during these difficult times? A: I am contemplating many things. However, I would personally emphasize the understanding of God as a parent. A father knows why and when to praise or scold his child. God gives both autumn and spring in our spiritual life. God permits all of this in our life, so that while He makes us wiser according to the measure of our growth in Christ, we live personally in a spirit of joy, and not in a dark, apocalyptic spirit. As the Apostle says, Here we have no continuing city, but we seek one to come (Heb. 13:14). This experience of God, logically, leads to the complete absence of desperation and inactivity. On the contrary, man is always prepared for a new beginning, always prepared to say: My Christ, here I am, I am coming back! Q: Are you able to do missionary work in the midst of the current situation? If so, how? A: We are part of our people, and we are not in conflict with the people. The canonicity of the Church does not suit the present political establishment. Despite the persecution conducted by the regime—and we know that the police enter people’s homes and intimidate them into not joining the canonical Church—still, today’s people are slowly leaving the totalitarian matrix. This matrix is characteristic of the Republic of Macedonia as the last dying bastion of Communism. But I am convinced that some find it easy—and that with time they will find it even easier—to recognize the authentic values of the One, Holy, Catholic and Apostolic Orthodox Church. Q: Has anyone been able to see Archbishop Jovan recently? What are the current conditions of his imprisonment? A: We are forbidden to visit him in prison. We were even forbidden to bring him Holy Communion. The regime did not allow him to take the Holy Scripture with him into prison, and they removed his robe from him. Because his robe is his skin, I once mentioned that it was as if his skin had been peeled off. For the funeral of his recently deceased father, the prison gave him only twenty-four hours free, although in other cases of death in the family, prisoners are given at least three days. He is denied free weekends. In a word, the current Macedonian government conducts religious discrimination not only outside but also within the prisons. Q: Do you see any change of heart taking place in the MOC or in the Macedonian government? A: For now, unfortunately, there isn’t a change of heart within the schismatic MOC. On the contrary, they are raising new false charges against the Archbishop before the secular courts. As for the secular politicians, they are inspired by the schismatic bishops who behave like politicians, but they will quickly change their policies when the Euro-Atlantic politicians point out to them that this discrimination stands in the way of integration. We thank God, for if He believes that we can endure these events which He permits, we try to accept them with the greatest humility. Q: Could you give a word to our English-speaking audience? A: God is Love. He is not selfish, and based on my utterly modest experience, I know that He is always looking for co-workers among the people for His labors, both visible and invisible. I think that the greatest and most praiseworthy challenge for every man, for all people, is to say: Why shouldn’t we be the people that Christ will find! Of course, in the Orthodox Church, according to the words of a certain Bishop, besides the air, we breathe the freedom given to us by the Third Hypostasis of the Consubstantial Holy Trinity: the Holy Spirit.